For a long time, the stigma of riding safe but looking funny has caused people to endure preventable serious injuries. Just like each gear has been crafted to serve its own individual job in a clock, the Chest Protector is a piece of safety gear that has been designed to save your vital organs unnecessary trauma. Typically associated with motocross sports, chest protectors have been making their way into the casual riders market thanks to lighter weight materials and less bulky appearances. Most of the chest protectors out on the market are made with molded polyethylene and polycarbonate panels that are attached securely to fabric. 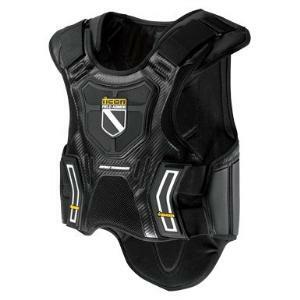 Depending on the design, some chest protectors will offer additional protection to the shoulders and spine as well using CE approved armor panels. There are a couple of differences between the chest protectors designed for racing on the track and ones which are for more casual riding. Brands like Fly Racing, EVS Sports, and SixSixOne pull out all the stops to create a chest protector that will absorb impacts at racing speeds. Most racing chest protectors tend to offer protection against your lower organs as well, and slip on like a vest to create a tight and snug fit. 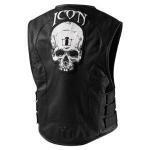 Icon and Alpinestars are brands that create less bulky chest protectors that are designed for less intense rides. Though they’re still made of impact absorbing molded plastics, these chest protectors are generally intended to be worn in addition to other motorcycle gear. Whether you’re going out for a weekend of intense sand dune or mountain trail riding, or just hitting up the freeway for a trek around a mountain, there’s nothing like having a little extra security around you to make you feel more relaxed and want to enjoy the ride that much more. Motorcycle chest protectors come in handy when you take that spill and land sternum first on a rock. The similar appearance of chest protectors and insect exoskeletons is far from accidental. Bugs can survive a lot of abuse. Their hard shells have allowed them to endure more damage than you'll ever see on the motocross circuit, so take a page from their book. In the beginning there were roost deflectors and chest protectors, and now we have the Vega ProGuard 'chest deflector'. Whatever you prefer to call them, they're all meant to shield your upper torso from the various puncture and impact hazards encountered in off-road riding.